The Dry Dock Bar is located on the Quay in Waterford, and is a typical Irish bar frequented by guests, locals and tourists seeking to have a taste of Irish life. At any time of the day you will encounter people enjoying a meal, swapping stories or having a coffee, beer or glass of wine. Relaxing music gives it a casual and informal atmosphere, making it the perfect place to be. 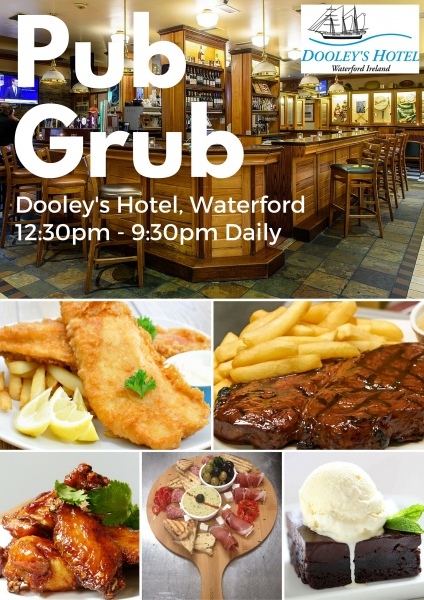 The Dry Dock Bar is an ideal place to sample a traditional Waterford Breakfast, Beef & Guinness Stew, Fresh Fish & chips, Salads and lots more!! Our Breakfast menu is served from 9.30am to 12 noon. Extensive Bar Menu is served from 12 noon to 21.30. Sunday’s are special at the Dry Dock Bar with a newly created carvery menu. Superb food and great atmosphere, the perfect destination for all the family. Sunday carvery 12.30 to 15.00. Enjoy live music in our Dry Dock Bar every weekend.